A new, mind blowing paper about colors. My first question after reading it was: we can see magenta differently than green, but so do cameras. Why? And how? Same reason. Their sensors are designed to mimic our eyes. Any sensor that wasn't capable of showing magenta would be considered defective and revised until it did. Remember that it is Engineers that build things and get them working, not scientists. Engineers will play around until it does what they want it to. Scientists will stick to a bad theory until death, it seems. Scientists like to say that all modern technology is a result of their work, but I think it is really a result of Engineers working through trial and error. The theories might get them in the right ball-park, but trial and error takes it from there. Gives an interesting re-take on "color-blindness" as well. Do the cones of the eye pick up photons/anti-photons at different strengths/wave lengths for some people? Immunofluorescent imaging is a way to determine red–green color coding. Conventional color coding is difficult for individuals with red–green color blindness (protanopia or deuteranopia) to discriminate. Replacing red with magenta or green with turquoise improves visibility for such individuals. 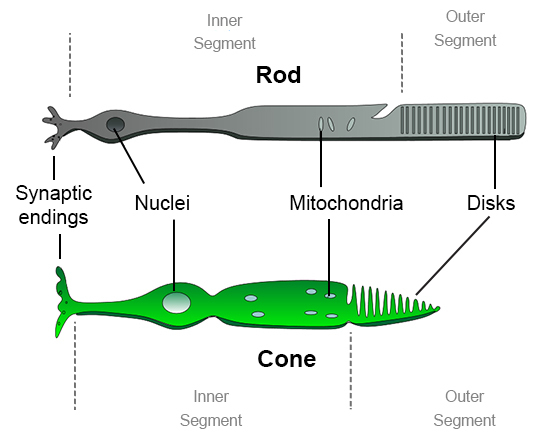 Wikipedia wrote: The typical human retina contains two kinds of light cells: the rod cells (active in low light) and the cone cells (active in normal daylight). Normally, there are three kinds of cone cells, each containing a different pigment, which are activated when the pigments absorb light. The spectral sensitivities of the cones differ; one is most sensitive to short wavelengths, one to medium wavelengths, and the third to medium-to-long wavelengths within the visible spectrum, with their peak sensitivities in the blue, green, and yellow-green regions of the spectrum, respectively. The absorption spectra of the three systems overlap, and combine to cover the visible spectrum. These receptors are known as short (S), medium (M), and long (L) wavelength cones, but are also often referred to as blue, green, and red cones, although this terminology is inaccurate. The receptors are each responsive to a wide range of wavelengths. For example, the long wavelength "red" receptor has its peak sensitivity in the yellow-green, some way from the red end (longest wavelength) of the visible spectrum. The sensitivity of normal color vision actually depends on the overlap between the absorption ranges of the three systems: different colors are recognized when the different types of cone are stimulated to different degrees. Red light, for example, stimulates the long wavelength cones much more than either of the others, and reducing the wavelength causes the other two cone systems to be increasingly stimulated, causing a gradual change in hue. If we instead take that a certain type of cones is more sensitive to antiphotons than to photons? The first thing that comes to mind is that the when looking at photos or display panels, some colors should be much less vibrant than when looking at natural objects, but also slightly different. Mathis talks about cameras and other machines. It is not that we are blind to the reds, yellows and greens at night, it is that they aren't there for some reason. Problem with that theory is that spectrometers tell us the spectrum of the Moon is the same as the Sun, so for the machine the reds are there. So why would the machine tell us they are, and our eyes tell us they aren't? Well, again, it is because our eyes are tuned to both photons and antiphotons, while the machine isn't. The machine was built by people who didn't know about antiphotons, so it couldn't possibly be built to register them, could it? The machine can't tell a left spin from a right spin, so all it can do is detect energy levels. If that energy level is present, it registers the color we have assigned to that energy. But our eyes don't see in such a simple way. So, I think my assumptions about cameras are not entirely correct. The brain pattern, eye movements and hormone secretion of volunteers were studied while they slept. Participants were also asked for subjective assessments of their sleep quality. The results, published in Current Biology, showed that around the full moon, subjects' brain activity associated with deep sleep decreased by 30%, they took 5 minutes longer to fall asleep, had 20 minutes less sleep overall and lower levels of melatonin – a hormone known to regulate sleep. These findings correlated with the volunteers' own perception that sleep quality was poorer during the full moon. "I think one issue in the past was that they compared a lot of people by mixing different laboratories, different devices, and including data from patients, so the entire thing was not standardised," Cajochen said. "The advantage here is that we really had a standardised protocol." The data was taken from a previous study that was not originally looking at the moon's influence. Participants were kept in a very controlled environment, with artificial lighting, regulated temperature and no way of checking the time. This ensured that internal body rhythms could be investigated independently of external influences. I don’t agree at all, firstly because even if stars have enough energy to have effects on the earth, they would give us at least a 50/50 mix of photons and “anti”. Secondly, I expect the effect of the moon to be caused by much more than reflected light. The moon is a recycling engine that always receive from the sun, earth and other planets and satellites and always emits the same ratio of photons and antiphotons that it (and the earth) receives. Now, the moon has a very peculiar property. It always shows the same face to the earth. I’m sure that all these phenomena are not tied to the full moon because of its reflected light, that’s only a coincidence, nothing strange or new about that (logically). No, they are tied to the full moon because of the charge channeling that peaks in that configuration, and that must have something to do with the missing spin of the moon (realative to the earth). I don’t yet know what this could be, but I’m really surprised that Mathis ignored the big picture to concentrate only on reflected light. What do you think? I think this one's a strange bird to tackle, even for Mathis. He delivers a mechanism, but behind it not much but conjecture. Doesn't mean he's wrong but of course I prefer things more fleshed out, as he does with some of his other theories. So I diagrammed the basic exchange from the Sun to the Earth to the moon, the flips of photons/antiphotons as I understand it. For the Earth to feel 1/3 antiphotons from the ambient (mostly Solar) charge, at the North Pole, it seems like they'd have to be coming from the northern hemisphere of the sun, generally. So the sun has it flipped, where its antiphotons mostly come in at its south pole? This is very rudimentary, obviously. But I'm not sure how more antiphotons from the moon would hit the Earth than regular ones, so it's not clear how the ratio is any different than the sun's really, aside from the flippage hemispherically. Sure, we've got an inclination of the moon of 5.14° but that isn't much. My diagram even exaggerates this, with the red antis from the moon having a cleaner path to Earth but the moon is also tilted, so that exaggeration isn't helpful really either. And we still have (it seems) enough regular photons in the mix to kinda cancel it out. Or at least, the further north on Earth you go, the moon should have a much lower cooling effect or even a warming effect, since there would be more regular photons there. It seems like in his paper, Mathis wants the moon to be emitting more antis because it's not spinning, but I'm not sure how that works mechanically? Mathis wrote: "I hope you can see how this affects the current question of Moonlight. You see the Moon because she is on the opposite side of the Earth from the Sun. She has to be, since if the Moon and Sun were on the same side, the light would be reflecting back to the Sun. You would never see it. So Moonlight is always coming from the opposite direction of Sunlight. This alone is enough to flip it. It doesn't have to be flipped in some fancy process at the surface of the Moon. All it has to do is bounce. The Moon's light is automatically antiphotonic simply because it is coming from the left when the Sun is right. In fact, all light coming from the direction of the Moon is antiphotonic, simply because it is coming from that direction. The light from the planets and stars, when falling at night, is also antiphotonic." Flipping a directional vector isn't the same as flipping chirality. A photon travels linearly as well as spinning (as we've seen) in all kinds of oblong patterns, over time. The "handed-ness" or clockwise/counter-clockwise motion doesn't appear to be linked to the linear motion in any way I can say. If that were the case, it would be a wash anyway, as we'd have to say that photons coming towards us are antis and those going away from us are not, or vice-versa. That is not the case, as both types of photons are of course coming at us, or else we'd have no potential collisions to be discussing at all. If we simplify the Solar System surrounding field as having all "south" photons going into the Sun, we should also simplify the "Earth System" field as having all the anti-south photons to go into the Earth. With this simplification, Moon receives at the South Pole the same photons the sun receives, and the opposite the earth receives. The moon exerts on the earth the same force that usually keeps planets and satellites and rings in place, but at a much smaller scale. I expect the same phenomena to occur at the sun from the planets. I also expect there is no moon phase that increases the phenomena, but the angle between the moon equator and the earth equator. But wouldn't the moon be receiving, at its south pole, generally the sun's ambient field as opposed to just the Earth's? The Earth is much closer, yes. So I suppose it's possible the moon feels more anti-photons from the Earth. But since both bodies are in the Sun's ambient field, which one would it feel more? I'll try to diagram what you're saying, but hope I'm following along properly. conjunction, the photons were both traveling the same direction, so if they bumped, their spins would stack. When in opposition, the photons—although still spinning the same direction—are now moving in opposite directions. So if they bump, their spins oppose. We saw how this explained the band color flip above, because that effect was a magnetic field effect. But in this case, we are looking only at field strength, which is a matter of photon density, not photon spin. In opposition, Saturn has the same number of photons regardless. And if the planets are aligned, those field densities will add. So in that thought-problem, identical opposing "left" spinners will be opposite each other, as they reach the sun. So I can see how they would be photon/anti, relative to each other. But to return to Magenta, we have a different frame of reference at our eyes. The rods and cones, if able to tell clockwise from counter, should then be sending different signals for each into our brains, where the color is actually resolved. Do we know how these cells would do such a thing? Is it possible that these gaps, being open on one side and not the other, are the place where anti-photon/photon separation is detected? Jared Magneson wrote: But wouldn't the moon be receiving, at its south pole, generally the sun's ambient field as opposed to just the Earth's? The Earth is much closer, yes. So I suppose it's possible the moon feels more anti-photons from the Earth. But since both bodies are in the Sun's ambient field, which one would it feel more? It doesn't matter how far away either entity is, it only matters how dense their charge field is at the body in question (Moon in this case). We know the Sun's charge field is more dense than the Earth's because they create the magnetosphere, ionosphere, etc which are all much closer to the Earth than they are to the Sun. With respect to photons and anti-photons, I was thinking about this a year or so ago and had a thought that might change a few things. I'm not sure if it is correct or not, but it may be important if it is. I was thinking about how photons enter the Earth from the Sun and why would photons go in one pole and anti-photons into the other. I imagined a single photon, actually 2 photons with one heading towards the north pole of the Earth and the other heading towards the south pole (but on a path 90° from the pole direction itself). On first attempt, I imagined that each photon was spinning the opposite to the other thereby one being a photon and one being an anti-photon. In a subsequent thought experiment, I imagined that they were not spinning differently so they were both the same type of photon on the journey from the Sun to the Earth. What happens as they start to enter the Earth? That is the main question. What happens to a photon as it turns to enter the pole of a planet? Actually, I've already overstepped the bounds in that last sentence. I have already suggested that they turn, but that is an assumption. An assumption that I think may be correct, because it seems that a photon should travel in the direction that its top level spin axis is pointing. So, moving on with that assumption, as they turn, their spin direction is turning as well. In fact, that spin axis is the only way we can tell if it has turned or not. What happens to each photon as they make this turn? Actually, let's just skip ahead and look at them after they have made a full 90° turn and are pointing straight down into the Earth or straight up into it. What direction are they spinning now? Opposite to each other! We have taken 2 photons that were indistinguishable from each other on the trip to the Earth and they have ended up different to each other once inside of the Earth. We have created anti-photons from photons! How does that create a 2:3 ratio? I'm not entirely sure of this part, but it could just be that the Earth is made from matter and not anti-matter, so it's own internal atoms are predominantly made of photons and they tamp down the incoming anti-photons but allow the photons to go through almost unimpeded. Therefore, when these incoming photons/anti-photons become the Earth's output charge, they create the 2:3 ratio. Why would the ratio change as the planet gets further away from the Sun? Possibly because of the charge field strength at that distance. The Sun's charge field diminishes with distance and the matter of the planet has less charge to tamp down and so it does a better job of it. Nevyn wrote: Why would the ratio change as the planet gets further away from the Sun? Possibly because of the charge field strength at that distance. The Sun's charge field diminishes with distance and the matter of the planet has less charge to tamp down and so it does a better job of it. It seems like the charge strength at any distance is already relatively balanced, since the planets have such relatively stable orbits balancing gravity against charge. So while the charge density decreases, the size of those outer planets is also increased and this offsets this diminishing charge strength. Or else the outer planets wouldn't be able to hold their orbits? But like you said, we're talking about ratios of photons to antis, which was part of my confusion or need for clarification earlier in my sun/earth/moon diagram. Does the moon feel the sun's charge similar to how the Earth feels it? If so, what mechanism do we have to cause the moon to bombard the Earth with antiphotons more than regular-spinners? The angles seem all wrong to make such a claim, given the mostly perpendicular facing of the moon. Is this where its lack of rotation might come into play? Your thoughts on how the photons of either spin enter the poles of the planets (and moons, one might assume) hold some water, but don't seem to explain how the moon might bombard us with more antis. What would cause the "turn" in that case, assuming you're right about the 90°-ish turns entering the poles? It seems like if the moon were outputting more antis in our direction, it should be outputting less along some other vector as a matter of balance. If we pore over the Mathisian papers, we find that Uranus is the closest to being in actual balance on both sides, with its axis tilted at 97°. So at Uranus, there's nowhere near a 90° turn necessary for solar charge to enter Uranus. Would Uranus then have no solar anti-photons, and only rely on the other Jovians for any imbalance? Jared Magneson wrote: It seems like the charge strength at any distance is already relatively balanced, since the planets have such relatively stable orbits balancing gravity against charge. So while the charge density decreases, the size of those outer planets is also increased and this offsets this diminishing charge strength. Or else the outer planets wouldn't be able to hold their orbits? That is a different kind of charge balance. In the case of an orbit, both photons and anti-photons work the same way because it is really just the electrical component that is in effect. It is only a pushing force, so the spin has little bearing on the situation. It does have some effect, as we see with Venus, but they don't have much to do with the orbit itself, more the rotation of the planet. The charge ratio I was talking about is measured in the planets charge emission where we find differences between photons and anti-photons. I'm not sure if we can measure that before it gets to the planet and if so, then my little theory above is wrong because it assumes that they are the same until they enter the planet or body. Jared Magneson wrote: But like you said, we're talking about ratios of photons to antis, which was part of my confusion or need for clarification earlier in my sun/earth/moon diagram. Does the moon feel the sun's charge similar to how the Earth feels it? If so, what mechanism do we have to cause the moon to bombard the Earth with antiphotons more than regular-spinners? The angles seem all wrong to make such a claim, given the mostly perpendicular facing of the moon. Is this where its lack of rotation might come into play? The only mechanism we need is collisions. 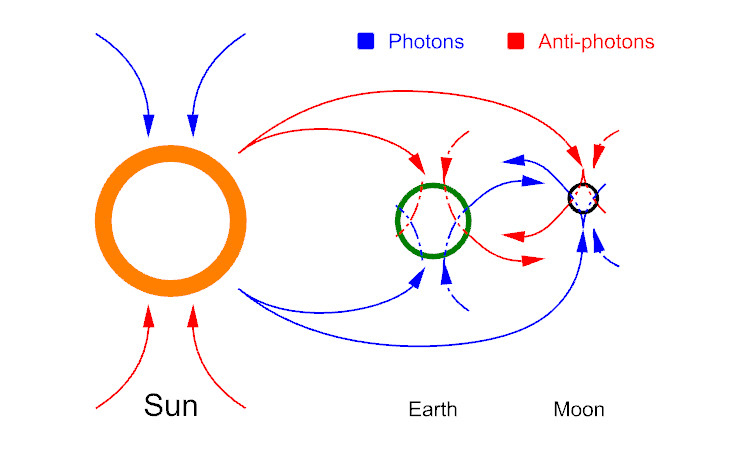 Each photon collides with the moon and that collision causes it to change its direction but maintains its spin. Now the photon is spinning the opposite way to what is was before it hit the moon. The moon is round so photons will bounce off in all directions (at least from the side facing the Sun) therefore some will be heading towards the Earth. I am using the same kind of mechanism in my theory above. 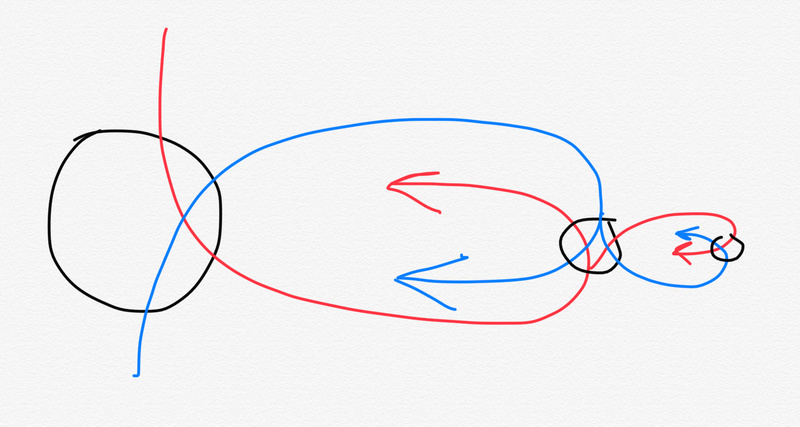 Collisions cause direction changes and that causes the spin axis to turn. The only difference is that Miles is assuming the photon/anti-photon ratio is already present before the collision with the moon or Earth. I am looking for a way for the planet or body to cause the spin differences. To know which is right and which is wrong, we would need to be able to measure photons coming from the Sun and determine if they are photons or anti-photons. If we don't find a difference, then we measure the charge output of the Earth and see if we find it there. Jared Magneson wrote: Your thoughts on how the photons of either spin enter the poles of the planets (and moons, one might assume) hold some water, but don't seem to explain how the moon might bombard us with more antis. What would cause the "turn" in that case, assuming you're right about the 90°-ish turns entering the poles? It seems like if the moon were outputting more antis in our direction, it should be outputting less along some other vector as a matter of balance. I answered some of this above but wanted to touch on that last sentence. There is no requirement that more antis in one direction means less in another. That would be the case if the antis were coming from the Sun and the bodies could not create any themselves. In that case, there is only so much supply and more in one area means less in another. However, that is not what Miles has described. He has stated that it is the collision that causes the direction change and because of that, the existing spin is now spinning in the opposite direction from a given observation direction. That actually validates my usage of the collision above. The spin axis is being turned but the spin itself is not changing direction at all. That may be a little hard to understand. How can it change but not change? Nevyn, you're not making sense again! The spin direction is relative to the spin axis. Given that axis, the particle can be spinning CW or CCW. That is what doesn't change. The spin is still spinning the same way with respect to that axis but that axis has been turned. Jared Magneson wrote: If we pore over the Mathisian papers, we find that Uranus is the closest to being in actual balance on both sides, with its axis tilted at 97°. So at Uranus, there's nowhere near a 90° turn necessary for solar charge to enter Uranus. Would Uranus then have no solar anti-photons, and only rely on the other Jovians for any imbalance? Using Miles model, then Uranus would be taking in both photons and anti-photons at the same pole. If the Sun is emitting both, then a planet on its side would be taking in both. In my model there is no difference in the incoming photons and there is no turn for them to change in any way so there would be no anti-photon production. Not sure which is right or even if either of them are. Sorry to join the conversation so late, I can barely follow Miles planetary charge field interaction calculations. I was hoping Ciaolo would continue the Expansion thread. The positional changes between us, sunlight and moonlight, in conjunction or opposition, may reverse the relative directions and the labels we assign to photons and antiphotons. With overlapping charge fields each situation needs careful consideration. It’s confusing, good, the latest papers add to our understanding. A planetary simulation including tilt would help. The more time I spend thinking on it would be better. Thought experiments work well in this area. Nevyn wrote. What happens to a photon as it turns to enter the pole of a planet? Here’s the answer I keep giving, If I improve it enough I may get an answer. The smallest light-speed XYZ photons may pass the planet’s pole tangentially with little or no collisions, I don’t see how they can be turned into the pole. The opposite is true with very large photons, say charged particles the size of electrons, positrons or larger. They may all spin with a tangential light speed, but their forward velocities are usually less than a very small percentage of light speed. I would agree that electrons or protons caught in a net charge field displacement approaching the pole would receive continuous collisions. They would certainly “turn”, adjusting for a receipt of a maximum charge throughput as they augur into the planet. Charge channeling between the sun and planets must include a variety of charge. It seems to me that the different species of charge would tend to differentiate as in the various layers of the magnetosphere. Layers of variously energized larger charged particles, of various photon quanta types.